That expression is exactly how I’ve been feeling lately. For awhile now actually. Lately I’ve found myself totally overwhelmed by the pressures of life. In fact…I can’t really remember a time when I haven’t felt the pressure (most of which I put on myself) to succeed, do more, be more, be better, work, work , work, work! I think the pressure fluctuates throughout the years but it’s always there…lurking….the 20 to do lists I have for this project and the ideas that needs to be worked out. YEESH! It’s like I’m trying to prove myself to MYSELF! Does that explanation make ANY sense? 6 years ago (whoa, time flies) at the age of 25 I felt the pressure of “life’s achievements” so much so that I quit my job (a good jawb with ‘fits AND it was ON the beach O_O), packed my stuff and moved to Africa. Now I’m not saying that wasn’t a great experience for me, but I think the pressure I put on myself to reach some”success” status got to me. I was supposed to own my own home by then, retire my Mother, have 3 kids and live on the beach somewhere. God knew how I was feeling and he provided me with a way to get away from all the E-Boards and the organizations I was actively serving in, so that I could well, get to know HIM and who I was in HIM. I learned so much about myself that year. It laid the foundation for me to be more present and SLOW down. Over the years I’ve had to remember this lesson (slow down, be present) because I’ve always made myself so busy. Sometimes it was me running from heartbreak (raise your hand if you’ve ever been there) or it’s just the thought that if I’m going to require my future husband to “have it all together” then I need to “have it all together”. Being told “slow down”, or “you’re doing too much” hasn’t really done much for me. What I’ve recently realized is that, I can’t do absolutely everything WELL. I need to pick 1 or 2 (3 things max) to focus on. Only then will I see the good fruits that Jesus wants from my tree. Yesterday morning I listened to an audio excerpt from Priscilla Shirer entitled, “Devotions with Priscilla” (it’s only $5 here). I listen to this devotional CD on the way to and from work almost every day. I can almost quote the excerpts by heart. On this particular day I had Disc 1 in my car’s CD player. The excerpt entitled, “Can We Talk?” came on. I listen in as always and hear the story of a farmer who has grown a prize winning tomato. Stay with me. So this farmer talks about how he grew this gigantic tomato and what it takes to win. Shirer uses this man’s farming techniques and advice to teach her audience about how we must weed and prune our gardens to produce a prize winning life. That’s where I drift off. Prune: Check….I’ve cut a few things off of the To-Do list(s) for now. But THEN I mentally check back in and listen to her explaining how she’d “rather juggle than prune any day”. It hits me…..and I realize how many tomatoes I REALLY had on my vine. I juggle like a jester! I AM the juggling multi-tasking MASTER. I am “She Who Juggles and Manages a TRILLION Things at Once” and PROUD of it. I’ve kept the good tomatoes on my vine, because well, they’re good, DUH! Howwwwever, they are undoubtedly taking nutrients, energy and mental capacity from my PRIZE winning tomatoes! Shirer’s sermon highlights weeding and pruning and how a mentor of her’s explained to her that she can do “Marriage, Motherhood and Ministry” but nothing else. Those were her prize winners, although there were other GOOD things that she wanted to do, these areas were her tomatoes that she could focus on and grow to win prizes. That is a much better accomplishment than a bunch of malnutritioned baby tomatoes. If we keep running ourselves into the ground with a bunch of things on our to-do lists we are CERTAINLY not doing them as well as we could with only 2-3. SO, I’ve decided to be more purposeful with my time and energy to grow a prize winner. In the past I’ve said this (y’all know)…however my plan was to stay up even later, to spend less time traveling, or cooking or doing the things that I absolutely love doing. I’m at a point now where I want to be able to have the time and energy to cook. To take a trip somewhere amazing and learn the culture, eat the food and see the sites once I land, instead of sleep a full day just to recover from my busy life. If I wasn’t doing so much to drain my energy so drastically I wouldn’t need to take an expensive trip somewhere to “get away” only to sleep it away. SMH! The most obvious mistake I’ve made is focusing on things that are not necessarily what the Father is doing. As John 5:19 explains, Jesus only did what the Father was doing. As a Christian we should be striving to be more like Jesus everyday. Not to say there weren’t amazingly GOOD things that He could have been doing, it just wasn’t what the Father was doing. He had to say no to A LOT of people and A LOT of good stuff. If you’re feeling overwhelmed like I am, it’s time to focus on not only doing what the Father wills, but to focus on only what the Father wills. Knowing the difference requires us getting to know Him better. To follow His footsteps also means we know his footsteps. Having meaningful work that contributes to the world in Jesus’ name, bringing Him glory in all that we’re doing is SO important. We know that the Lord will bless the ventures that are designed to bring him glory. He will guide us when we step out on faith to win the prize of His approval. To give Him a life that is full of prize winners. As the universe would have it Shirley (@shirleybeniang) one of my favorite YouTubers has posted a video recently speaking of focus and commitment! So here’s a little transparency. Using the Vine guide above I’ve tried to Identify the tomatoes of my current season. Honestly, I have NO idea if these are the exact tomatoes that need the most focus, but as I seek God first and pray I know that it will become very clear to me. In my mind I feel like these 3 were already the tomatoes I focused on growing, but my actions reflect something very different. Trips I should have said no to, shopping trips I should have saved money on, dates with randoms, nights out on the town with friends that should have been spent at home editing/planning/filming/researching. If you’re unsure of where your focus is, check your bank account. :) Talk about a revelation. What’s your vine looking like? What types of things will you need to weed and prune? What are the “good” things that just aren’t going to make the cut because they’re stealing nutrients from your prize winner? 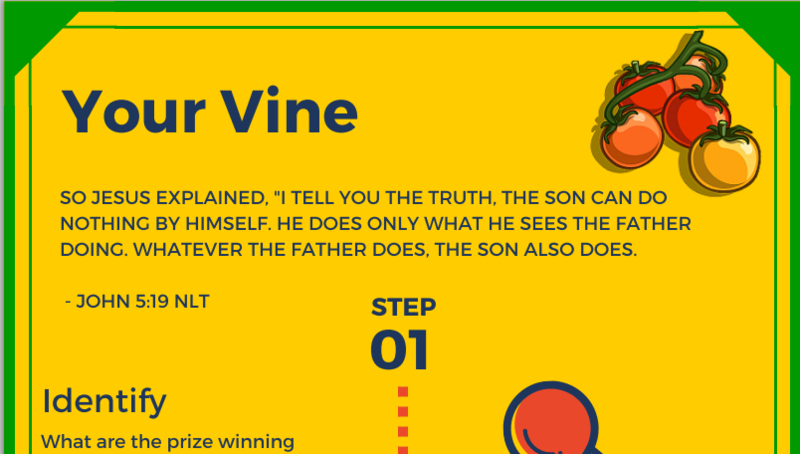 If you’d like to print out the Vine diagram I created click this link for the pdf. Can’t wait to read your vine stories. I’ve got lots of planning to do, I’m out! P.S. Remember that no one is perfect, however always strive to do your very BEST!